Sadly Samuel did not make it to the second round of The Aperiodical’s Big Internet Math Off, but lucky for y’all in a fit of profound arrogance, as well as trying to deal with some potential scheduling issues which could have accompanied victory, they had already made all of their entries. Instead of letting them languish in the dust bin of mathematical communication history Samuel has decided to release them anyway. 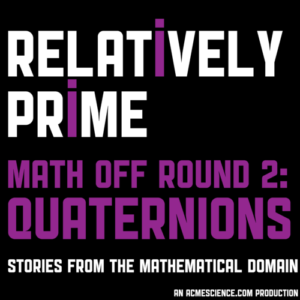 This would-be second round entry is all about William Rowan Hamilton, quaternions, and the walk in their honor. It includes a beautiful song by Jess Charlton.You can hear the PRX STEM Story Project funded piece some of the tape was originally gathered for here. Don’t forget to vote in the second round of The Big Internet Math Off even though Samuel is not in it. All the apologies to Lin-Manuel.